I know that Spring technically starts in March, but it never feels like Spring to me until April rolls around. So when I was planning my April storytimes, I decided to start the month off with some Spring-like themes. The first one we did today: Gardens! Kevin Henkes’ books always make me smile. I think it’s due to the colorful artwork and the way the text always leads to interesting discussions with preschoolers. This book is no exception. A little girl helps her mother in the garden and imagines what her own garden would be like. 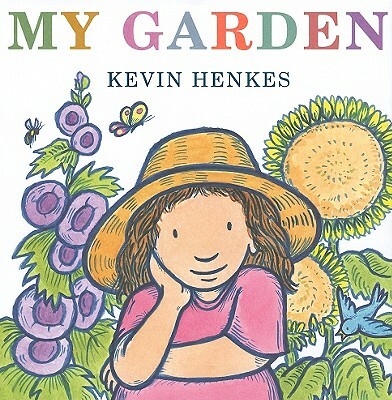 The pinks, purples, greens, and blues of the illustrations invoke a sense of spring, and after reading this story, I love to ask the kids what they would grow in their own gardens. When a farmer grows a gigantic turnip, he needs some help pulling it out. So he calls for his wife, who calls for their daughter, who calls for the dog, who calls for the cat, who calls for the mouse. 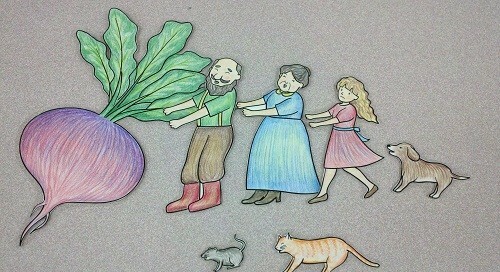 I place the pieces on the flannelboard as I tell the story, and I have the kids mime pulling the turnip out with me. When I first introduced the turnip to the kids, one little girl said, “No, it’s a radish!” so I called it a turnip-radish for the rest of the story. 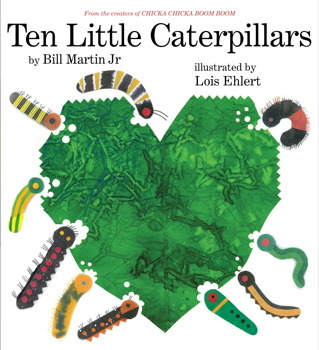 Book #2: Ten Little Caterpillars by Bill Martin Jr. This is a concept book in which ten little caterpillars traverse on some plants. Okay, not all of them are on plants, but there are enough plants in this book for me to include it in a garden theme. And while my summary doesn’t make this book sound very interesting, trust me when I say that it’s lovely and very informative, especially for one-on-one readings. Also – spoiler alert – the tenth little caterpillar turns into a butterfly! 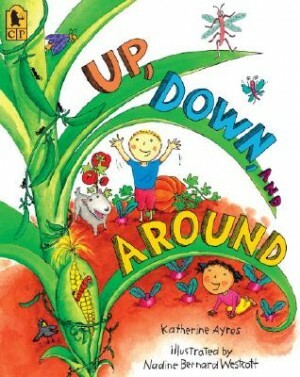 In this book, we learn which plants grow up, which grow down, and which grow all around. This is a great book to use in storytime because it encourages the children to move while you’re reading the story. I have them stand up, squat down, and turn around at the appropriate times as I read the story, and they absolutely love it! 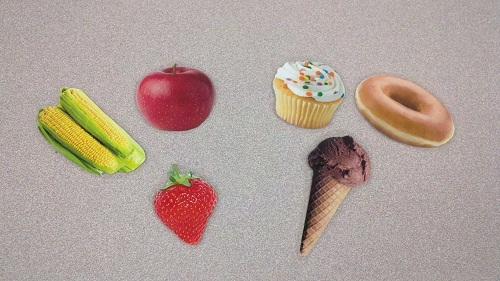 I usually use this flannel set for a sorting game of Things to Eat Sometimes vs. Things to Eat All the Time, but I decided that it could also work as a Things that Grow in the Garden vs. Things that Don’t Grow in the Garden sorting game. Rhyme Cube: I forgot about the rhyme cube today! We had a big crowd, and I got distracted, and by the time I remembered, I had already announced that it was time for the closing song. 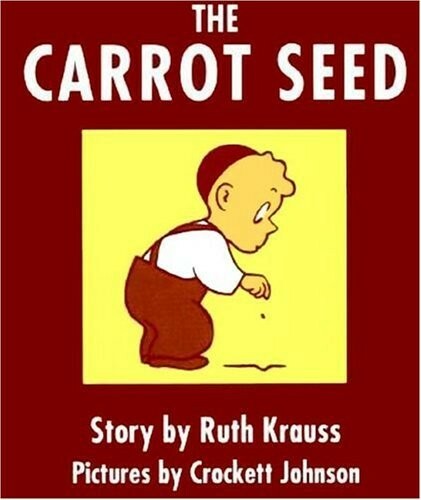 I wrapped storytime up with this short but sweet classic about a little boy who plants a carrot seed and believes that it will grow despite his naysayers. This storytime theme worked exceptionally well, though I think that’s partially due to having such a big crowd. The books caused lots of discussion, and the kids really enjoyed helping me pull the turnip-radish out of the ground and telling me whether the food grew in a garden or not.